NEGAUNEE — The Westwood High School varsity football team marched into Negaunee and made a statement on Thursday night. While the Patriots had already secured a spot in the upcoming MHSAA playoffs, the Miners still needed a win to punch their ticket to the postseason for the first time in two seasons. Westwood put that idea to a major halt, though, shutting out Negaunee 44-0 at Miners Stadium. The Patriots finish the regular season at 7-2, while Negaunee drops to 5-4. Both teams now await the MHSAA selection show on Sunday, with the Miners’ playoff fate uncertain. Teams at 5-4 and 4-4 are added to the 11-player field to bring it up to 256 teams after all the six-win-and-better teams take their spots. Westwood head coach Scott Syrjala said he expected the game to be more of a battle, crediting his players for playing a complete game. 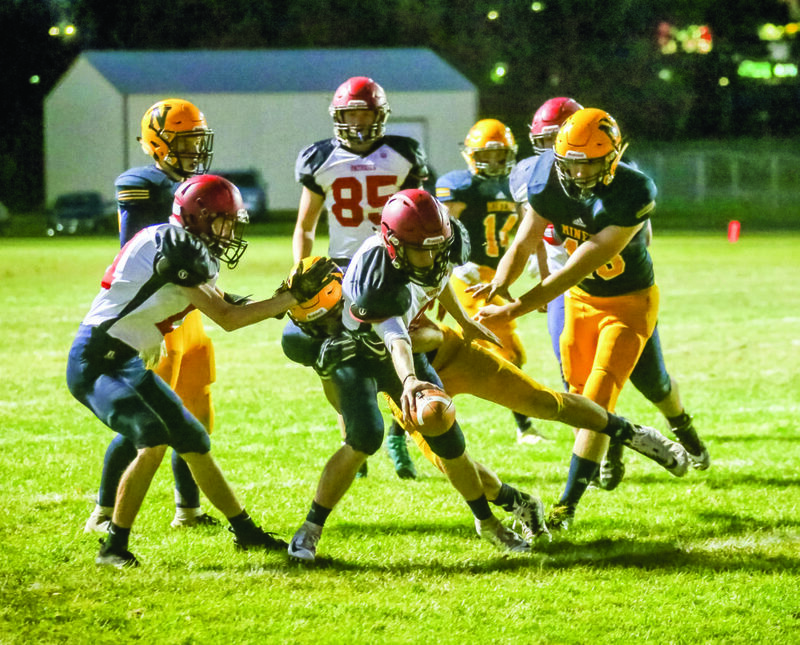 “Any time you can come into Negaunee and get a win like that, whether it’s a close win or dominating performance, I respect Negaunee’s program a lot,” he said. “They’ve got great tradition here and we knew it was going to be a battle. Westwood senior quarterback Nathan Beckman said it was a total team win. Negaunee head coach Paul Jacobson kept things simple, crediting the Patriots and thanking his seniors, simply hoping he gets another game with them. “Westwood is a good ball team,” he said. “They played well and earned the victory. We had some kids compete, but it’s always hard in a game like this. In the first half, it was all Patriots. On the third play after the opening kickoff, Beckman found fellow senior running back Ashton Bergman down the right sideline on 3rd-and-5 for a 68-yard touchdown pass. The conversion run from Beckman was good for an 8-0 Patriots’ lead just under two minutes in. After the Miners failed to score on the ensuing possession, the Patriots struck again. On 1st-and-goal from the Miners 4-yard line, Beckman took a QB keeper in for the score. A pitch to junior running back Taylor Dellangelo for the two-point conversion made it 16-0 with 2:05 left in the first quarter. Negaunee muffed the ensuing kickoff, which was recovered by the Patriots. They capitalized for more points on the turnover, despite taking a delay-of-game penalty after they moved inside the Miners 10. That was because Beckman found senior wide receiver Jacob Adriano on the left side for a 14-yard TD pass on 4th-and-goal. The QB also converted the two-point try again, making it 24-0 at halftime. Westwood kept pouring it on in the third, with Beckman finding the end zone again on a 14-yard rush. The conversion by Beckman made it 32-0. Negaunee had a chance to break the shutout late in the third when quarterback Jason Waterman, on 3rd-and-7 from his own 49, found Keegan Erva downfield on the left side. But the ball however went in and out of Erva’s hands and fell incomplete. Another incomplete pass on fourth down turned the ball back to the Patriots. Bergman added a 1-yard TD run early in the fourth while senior Troy Anderson scampered for a 55-yard TD run with 2:15 left for the final score. Beckman led the Patriots both through the air and on the ground, going 4 of 5 passing for 106 yards and two TDs, while rushing for 127 yards on 18 carries and two more scores. Bergman added 68 yards on 16 rushing attempts and had 75 yards receiving, with one TD of each. For Negaunee, Waterman was 3 for 10 passing for 11 yards. He added 17 yards on the ground while Drew DuShane led Miners’ rushers with 22 yards. Westwood had 374 yards of total offense to Negaunee’s 103. Syrjala said his team, as well as their families and friends, will get together for Selection Sunday to be shown on Fox Sports Detroit at 7 p.m. Sunday. “It’s a new season for us,” he said. “We were fortunate enough to make the playoffs, we’ve got great kids and that makes it easy for me as a football coach.